Lacquer Lockdown: Hot Off The Stamping Press: Cici & Sisi Jumbo Plates! Hot Off The Stamping Press: Cici & Sisi Jumbo Plates! It's been a few quiet days around here while I've been busy sorting out work issues and the like. However I should have some nail art posted a bit later today or tomorrow morning, but for now more new plates coming off the stamping press. I just discovered 2 new brands that are making me so excited, but I'm just gonna focus on one for today until I can nail down the rest. Today I'm showing you some new plates by Cici & Sisi (UPDATE: See review here). This is a new company that has released 2 jumbo sized plate sets this weekend on Amazon. The sets each contain 6 plates and over 216 individual images. They come in a little leather-esque holder (think Pueen style) and include a small gray squishy stamper and a scraper (you all should know by now though how I feel about metal scrapers). Apparently the plates also come with stickers/decals which is a nice bonus. As far as I can see the plates have a pretty nice plastic hard backing that makes them easy to clean and use. The images appear to be full size nail images. I think these plates are pretty cute! What I like the most about them though is that if you are new to the stamping game these bundles allow you to attain a substantial amount of images without having to buy multiple plates separately. The sets retail for $29 USD per set and will ship free with Amazon Super Shipping. I have no idea if this is the introductory price or the set price for the future but that breaks down to roughly $5 per plate which is a pretty good deal! You can find the Cici & Sisi plates here on Amazon. I will post up a review (click here) when I get mine. Thanks so much for reading and see you next post! I'm looking forward to your review!! Thank you for enabling me. LOL! I am so excited to see your review. I purchased both sets. I am hoping that there is extra pockets in those holders for my Bunny Nail and MJ Plates. When you do your review I would love if you compared the size of the plate as a whole to another known plate. Thanks so much for sharing! I can't wait for mine to come! 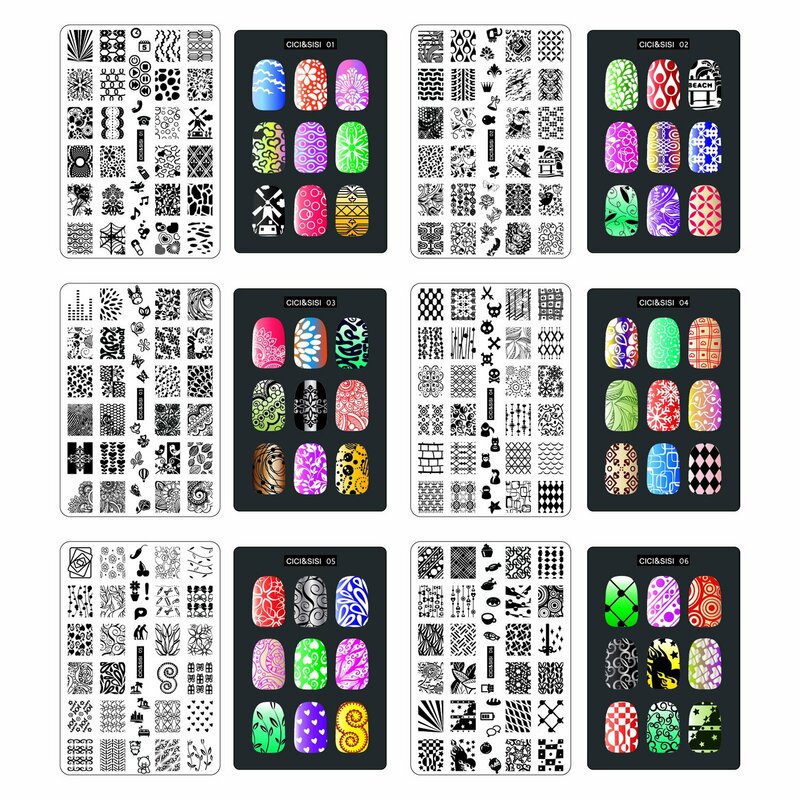 Some beautiful images for full nail decal making. I am a bit obsessed with that technique at the time. LOL! there is no place that delivers to Italy? There should be. My friend in Germany asked me to order these for her but then found out she could get them via Amazon I believe. Since it's still Europe I think you should be able to arrange similar delivery. You can also try contact Cici & Sisi directly on their website.